I moved my herb garden to the side of the house after we got the puppies. Having it run the length of the fence by the lane was asking for destruction…. which they promptly did. During the summer the new herb garden gets filtered sunlight all day, with a bit of direct sun mid-afternoon. During the winter it gets direct sun almost all day. Apparently the parsley loves cold, damp weather and lots of sun. I accidentally left it in last winter and it thrived. I intentionally left it this winter and it’s taking over the garden. Now I have to use it. 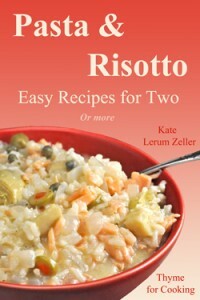 Soup for winter; light soup for ‘after the holidays’. Add stock, lemon juice, 1/4 cup parsley and heat to simmering. Whisk eggs and bread crumbs together. Pour egg mixture soup, stirring a few times. 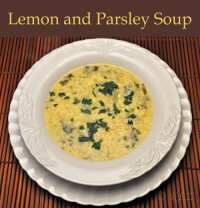 Ladle into soup bowls, sprinkle with remaining parsley and serve. Mon mari has been busy, but we have nothing to show for it. Nothing new, anyway. He’s been doing the last coats of paint and varnish, and other bits of trim. So I thought I would show you the dogs…. I’ve been channeling the pioneer spirit, trying to accustom myself to living with a dirt floor. You know – look on the bright side, stiff upper lip, be positive…. All that crap. The house and dogs will be clean again in a few weeks. I can wait and in the meantime, I decided, I can ignore. This is Bonnie, after she’s had a few hours to dry off. In case you don’t remember, Bonnie is mainly white with black…. She has no brown fur at all. And her belly is all white, or should be. Guapa, on the other hand is white with brown patches on her back. Other than her face, she has no black anywhere. And definitely no gray. I think I need to do some more trimming. I suggested to mon mari that he hold them down while I shave their bellies…. 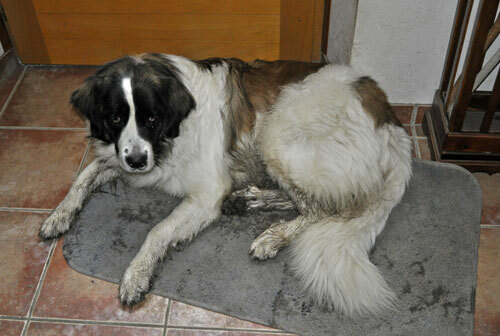 Grubby – but still gorgeous !! Are you familiar with the children’s book “What a Mess” ?? Love the sound of this soup. 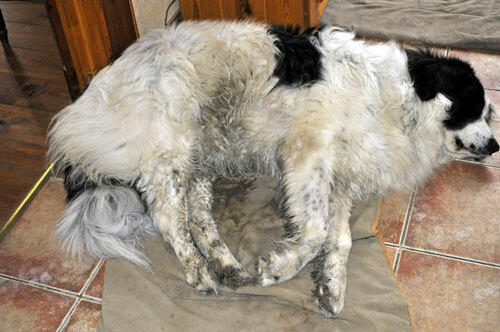 Grubby dogs are a fact of life, I’m afraid. It will brush out once they are dry, but the problem is how do you get them dry during wet weather? I’m lucky, Cora is mostly black with brown paws, so not much shows in her coat. Of course, it _does_ rub off on her sleeping chair, which is why we keep a sheet over that and wash it frequently. Your dogs are beautiful, even when they are muddy. Kate, no, I don’t know the book…. but they are a mess! Karen, I was happy with it… Fresh and light.